First aid training and health and safety precautions are often taken for granted in the work place. This article will show the importance of first aid training and how it is vital to ensuring safety for workers and customers alike. Ah yes, the dreaded job application. As many people would agree, most job applications are often jam packed with questions and formalities you may think are often irrelevant to the role you’re applying for. While this often takes the form of questions asking how many pets you have or what your first choice would be if you could have a superpower and how this somehow dictates your job suitability, weirdly, the question that unsettles people the most is are you trained in first aid? While most sigh as they tick the ‘no’ box and gear up for their two-hour health and safety extravaganza, what often falls by the wayside is the realisation of how important first aid training courses are to ensure the smooth and efficient operation of any business or company. First aid training is an essential part of most job applications. This is not just as a legal necessity but as a mechanism for ensuring that employees can operate to the best of their capabilities within a safe working environment and also fulfil a duty of care to their customers to provide them with sufficient security. At first protocol, this can ensure that the best actions are taken on the behalf of the patient before they are taken to hospital. Therefore, this can entrust a lot of responsibility upon an individual to ensure the safety of another and also illustrate how first aid training is necessitated within a modern workplace. Therefore, this post will try to explain further why we need first aid training, what this will involve and what to look out for when signing for a first aid training course. While I’m sure there are people reading this with desks jobs questioning why they need to know about the perils of dangers such as poisoning, what first aid training does is provide a blanket layer of protection where employees are prepared to act fast and safely to ensure their own safety and that of their colleagues no matter what situation they are presented with. While this can help your colleagues, who are experiencing less serious problems such as a minor burn as a result of cooking or a small cut, it can also prevent these incidents from escalating or halt more serious occurrences. For example, if one of your colleagues were to experience a fit or a respiratory problem while at work, though you may not be qualified to operate a full medical procedure on the individual, with adequate first aid training you could prevent the scenario from worsening and also provide the best possible conditions for a medical professional to complete the recovery. This will also be important in instances where a patient can be taken to hospital as quickly as possible or for them to be taken to hospital. First aid training will also have significant repercussions on more manual labour focussed work. For example, with the sheer volume of companies using warehouses, many of these will be frequent users of equipment such as forklift trucks. The EU Osha standards stipulates that forklift training must come with practical and formal training. This will also involve understanding how the machinery works, covering issues such as its weight, traveling speed, stability and turning radius and also what your responsibility is as a forklift driver. While it may seem obvious to some readers as to why there should be training when using large machinery such as a forklift truck, these precautions are also important for the guarantee of the driver’s workmates as well as themselves. This comes following the release of government statistics which rank forklifts highly among one of the most dangerous forms of workplace transport, with around 1,300 persons being hospitalised due to injuries involving forklift trucks. While not all jobs will require the completion of a first aid training course as a prerequisite to starting, and instead provide their own training (depending on the role you are applying for), they will largely cover a lot of the same bases. Your first aid course will cover a blend of both practical and theory-based training usually over a one-day period. This will involve how to diagnose a medical condition when it is presented to you and also learn how to control other scenarios involving bleeding and trauma. This will be vital to overcome potentially lifesaving situations where you can aid your patient’s initial recovery before a medical professional arrives at the scene to complete the recovery at the given location or take them to a hospital for extra medical assistance. This will also cover how to deal with other appropriate medical scenarios such as burns, bleeding, head injuries, fits, asthma to name but a few. This will involve demonstrations which are provided throughout the course where you may be asked to either assist or observe depending on the procedure being shown. You will then be assessed throughout the day on how you take to the demonstrations and if you are successful you will be accredited with a certificate which lasts up to three years. Be prepared. First aid courses can often contain distressing or upsetting material due to their depictions of real-life emergency situations. It may be better to attend paid courses. 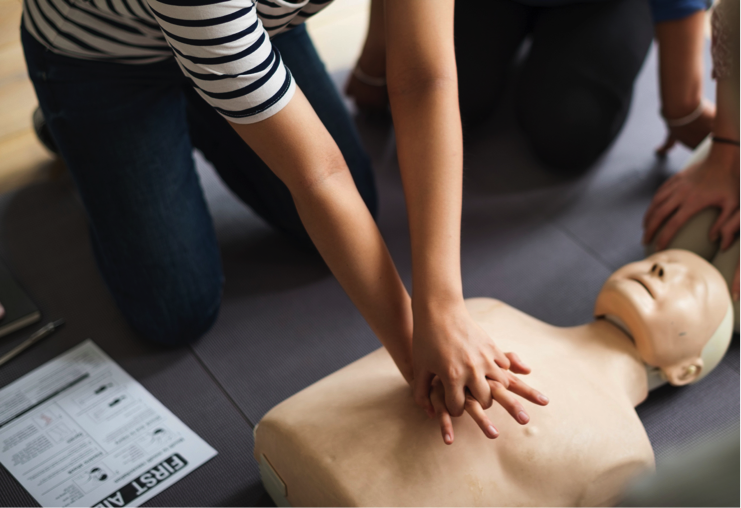 While they can be a good introduction to first aid, some free courses often try to cut corners and can be limiting due to a lack of resources, appropriate personnel and adequate teaching. You may also not receive certification for completing the course. Find out if the job you are applying for requires you to complete a full first aid training course prior to your application. A lot of jobs will provide their own training prior to you starting.